LIMASSOL, Cyprus, March 26, 2019 /PRNewswire/ -- After renaming its German-based investment banking business to JFD Bank AG, JFD Group Ltd consolidates retail and institutional services under the brand JFD Bank. The website www.JFDBANK.com is the new online hub for all current and future services offered by the FinTech group. JFD Bank AG is the new name of the German-based investment bank acquired by JFD Group in 2018. The final stage of the transaction was completed in March 2019, when the remaining 20% of the shares were exchanged. Following this major milestone, JFD Group Ltd. is now the single owner of the BaFin-regulated entity, allowing the company to offer services such as designated sponsoring, institutional sales trading, initial public offerings, transaction structuring and more. JFD Bank AG is also a Capital markets Partner in the Frankfurt, Munich, Düsseldorf and Vienna stock exchanges. JFDBANK.com is the new online hub for all current and future services offered by JFD. Retail, professional and institutional clients can now find all the information and services they need under a single domain, constituted by various entities of the group. This consolidation is the first step in offering a unique one-stop multi-asset experience for trading and investment services for both individuals and corporations. The website features a new section with all the institutional services offered by the company. They cover all the needs of businesses and corporations when it comes to trading and investing – Prime Brokerage & Liquidity, Designated Sponsoring, Institutional Sales Trading, Capital Markets & Investment Banking. "Launching JFD Bank has been a challenging task and a tremendous success for us. It marks the end of a long, very complicated and sometimes frustrating process of acquiring a regulated German investment bank and getting all the necessary approvals," shares Lars Gottwik, founder and CEO of JFD. "However, for us this is also the beginning of a new, even more exciting part of our journey. JFD is on a mission to set new standards in the trading, investing and banking world, and JFDBANK.com is just the beginning." Earlier this year JFD already challenged the status quo of traditional brokers and investment intermediaries by introducing zero-fee stock trading for its clients. The new conditions came with no limitations to number of trades, minimum volumes, or additional monthly fees and charges. JFD clients can now trade over 600 US, German and Dutch stocks via both MetaTrader 5 and Guidants platforms. The company also provides Forex and CFD trading on ETFs, Indices, Commodities, Cryptocurrencies and Bonds, encompassing 1,500+ instruments across 9 asset classes. 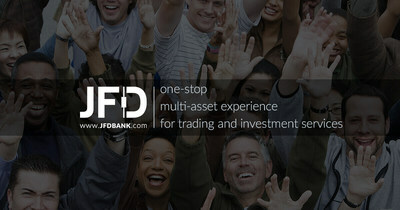 More information about all the services offered under the brand JFD Bank can be found at www.jfdbank.com. JFD Bank is a registered trademark and trading name owned and used by the JFD Group of Companies. The parent entity, JFD Group Ltd was launched in December 2011 and is now an internationally licensed global provider of multi-asset trading and investment solutions. It provides commission-free trading in real stocks and Crypto CFDs as well as extremely competitive pricing for trading and investing in 1,500+ instruments across 9 asset classes. JFD is acknowledged by numerous independent sources as one of the fastest-growing and respected financial companies worldwide. Thanks to its core values of transparency, fairness and trust, many experienced investors consider the company as their best choice for self-trading, portfolio management and investment advisory solutions. JFD Group of Companies constitutes of JFD Group Ltd, (License Number 150/11), JFD Overseas Ltd (License Number 17933) and JFD Bank AG (License Number 120056).